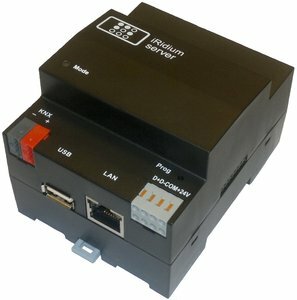 The iRidium server UMC is a complete kit with a RS485 connection, KNX TP1-connection and OneWire connection. Including the Enterprise+ license. The iRidium server UMC C3, including our iRidium server software. This version (C3 - RS485 + KNX) has 1 (one) integrated RS485 connection, 1 (one) KNX TP1-connection and 1 OneWire connection. A Enterprise+ license for all protocols and an unlimited number of controlpanels. Warning: the license is suitable for an unlimited number of controlpanels, but the hardware is for sure not 'limited'. 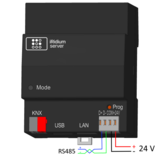 This means, in pratice, you can connect a number of 15 controlpanels, depending the number of drivers and scripts you are using inside the iRidium server. Are you an installer or system-integrator, and you want to order via our site with attractive discounts? Ask for an account via our email-address info[at]iRidiumServer.com. Please mention your address-details, your email-address and website, your VAT-ID (for the correct invoice) and your Chamber of Commerce-number. After receiving your email, we will create an account for you, and send to you the details a.s.a.p. Take a look on our website for all details and specifications!